Bathhouse opening. Emperor’s Bathhouse, is a new premier bathhouse opening later this month in Wellington, New Zealand. The phrase in the Logo “How are you sweating?” has been used because in Roman times, the men would relax in the spa or steam bathhouse, and when another man came along, they would greet one another with the question, “How are you sweating?” This phrase was used in the context of the bathhouse in ancient times, as we use “How are you?” out in the street. Their mission is to provide an exclusive, safe and inspiring venue for the gay community. 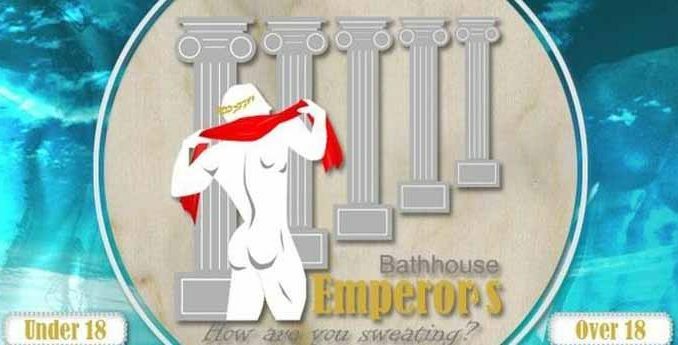 Emperor’s Bathhouse is a premier Gay Sauna that is proudly owned and operated by gay men. They are determined to provide an exclusive, safe and inspiring venue for the gay community. You will find a nice environment and besides the infrared sauna, a steam room and spa, they also offer private retreats and fantasy rooms, a pool table, cinema and much more. The entire concept of the bathhouse is to mimic the true Roman traditions of the past. Emperor’s Bathhouse is located at 5 Wigan Street, and it’s grand opening will take place on January 28th at 4pm. Be there or be square! You can follow Emperor’s Bathhouse on Twitter and Facebook.